About two months ago, I traveled to the beautiful country of Panama for Christmas vacation. I hadn't been there in over... well let's just say I haven't been there since I was a kid. My mother and aunt bought a lovely home together in the Brisas del Gulf section of Panama City after they retired from their respective jobs in the states and I needed to see what all the fuss was about. Needless to say, I fell in love with the country. I told my mom that I was coming to Panama to take a breather from the rat race in NYC and really did not have much desire to see family I haven't seen in ages. My mother complied with my wishes on the one condition that we go see my "uncle" Bull who was in the terminal stages of cancer which I most readily agreed to. When we went to go see him, the person that greeted us was a shrunken shell of the man that gave me the nickname "Brukfoot" when I was a toddler. I needed corrective shoes when i was about one to two years old to straighten out my legs and since then Bull has always called me that. Looking around his empty apartment sparsely decorated with his meager possessions, I saw Bull as a man that was ready to leave this plane. In a dark corner I spied a stack of vinyl LPs. Being the record digger that I am, I couldn't help being magnetically attracted by their gravitational pull. Rare old school gems from Panamanian labels like Tamayo , Sally Ruth and Taboga just sitting there for the taking. Long story short, Bull said I was free to take any record that I desired and whatever I didn't take he would leave in his will for me. My aunt reprimanded for taking the last vestiges of Bull's legacy while my mother advised me to take all the records now while I can and whatever I can't carry on the plane I should leave at her house to pick up at a later date. When we finished our visit, Bull looked at me and said in an optimistic tone "Don't worry, Brukfoot. You'll see me again." On February 24, 2010, Sydney "Bull" Brathwaite succumbed to his battle against cancer but he was right about one thing, every time I play these pieces of history I see him. Bull, you will be missed. Love Brukfoot. 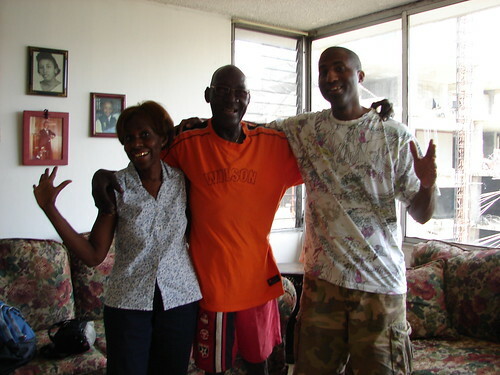 Me, my aunt Fina and my uncle Bull. We did not plan that pose.